HTTPS secures the connection to the website you are visiting. I’m sure you have seen this in action; look at the address bar in the browser and find the lock icon on the left-hand side. Is the lock closed? Then the connection is secure. Is it open or is there another type of icon or message? Then it’s not secure and vulnerable to attack. Using a site over a non-secure connection means hackers/criminals could intercept the data you send to the site, like your password and email address. Here, I’ll explain what HTTPS is and why it plays a role in SEO.When you type in a URL in the search bar, your browser asks the site for its IP address – for instance 123.456.7.89. This number is the actual address that a site gets online.The browser connects to this number in the hopes this is the correct site. This is all done in plain sight and there is no encryption to be seen, so everyone can intercept this traffic. So when you want to log in to a site that you connect to via an HTTP connection, the data you enter – username and password – is sent in plain text. Trust me, that’s really bad. Think about what would happen if you’d connect to your bank this way. Besides securing the web, HTTPS is necessary for sites that want to upgrade to a new, safer and much faster Internet protocol called HTTP/2. HTTP/2 includes different new technologies that make sites a lot faster to load. Everyone has the right to privacy on the web. We are doing so many mission-critical things on the web these days that we can use any kind of security we can get. An ever-increasing number of websites is making the move to HTTPS. In the screenshot below, you can see that at the moment, 61% of the sites that Firefox loads are being sent over HTTPS. 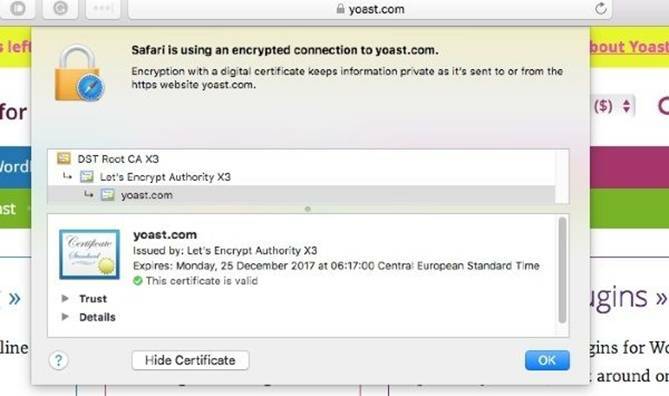 HTTPS is a must for any type of site, even if you own the bakery around the corner and don’t send or request sensitive data via your website. In 2014, Google announced that HTTPS would become a ranking signal. Today, your rankings will hardly change when you activate HTTPS. But it’s not just about rankings as much as it is about user experience and gaining trust with your future customers. It’s inevitable that we are moving to an all-HTTPS web. It is, therefore, incredibly important that your site makes the switch to HTTPS in the coming year. Several browsers now show ‘not secure’ messages when your site doesn’t have an HTTPS connection or when you try to send data via HTTP on your HTTPS site. Don’t forget, it’s easy to scare off visitors! Wouldn’t you switch over to the site of a competitor when you’d see something like the ‘not secure’ message in the screenshot below? A few years ago, switching to HTTPS was a major undertaking. Some big sites waited years to do it because it came with several challenges, like speed issues and the cost/benefit issue. These days, while still not easy, it’s manageable. If you’re planning to make the switch to HTTPS, be sure to let us lead you through a checklist so you don’t forget anything during the process.